I’ve put this song in The Jungle before, but here it is again with chords. 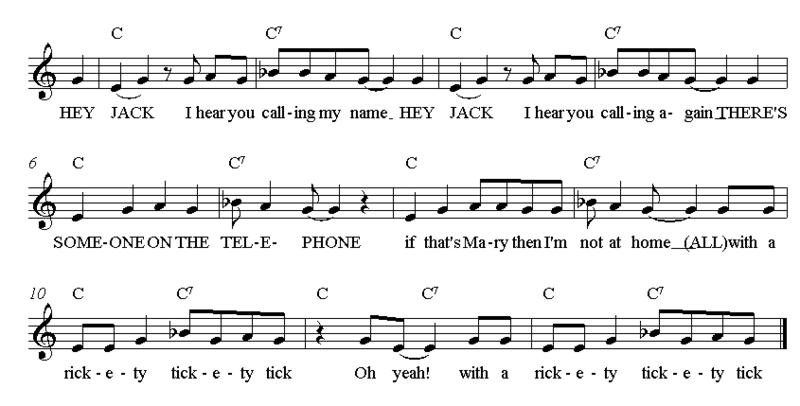 I had a great time teaching three year 4 classes, and then a mixed year 3 and 4 class to sing and play this song earlier this week, and it worked like a charm. Totally brilliant. I love it when a plan comes together! The year 4s are all aged 8 going on 18, and rebelling at the idea of singing “baby” songs – but unfortunately when it is your first lesson on an instrument it is bound to have to be a bit simple. It made for a fairly tough first lesson, probably not helped by the fact that they had just come in from kick-boxing. So I was bracing myself for another – shall we say – “lively” afternoon, when I suddenly remembered this song. It sounds so much more grown up than Row your boat. First off, I explained that the song was about two people having a conversation, and then taught it. I didn’t bother with the singing game, just did line by line “listen and copy” until the song was reasonably secure. Then we did some “watch and copy” movements in time to a drum track with a strong rhythmic beat (“Syncopate it” from “Music Express – Developing Skills” which is probably my most used resource). On to the ukulele bit. Having sorted out how to hold and strum the ukuleles, I used the track again for strumming in time to a beat; switching between “once per bar” and “twice per bar”. NOTE – if you start the children off by having them put their thumb on their nose before you strum, there is a good chance that you will get most of them strumming DOWNWARDS with their thumb instead of upwards with their whole hand! I carefully explained the C chord, which we had done last week, and the C7 chord, and how to read the chord chart – this is worth a whole post on its own – and gave them the task of working in pairs to learn how to play the two chords. This gave me a chance to go round the class and sort out problems. This entry was posted in Class Teaching, Lessons that have happened, Ukulele. Bookmark the permalink.